As a rule, teams spread out the signing bonus in three installments over the first 12 months. 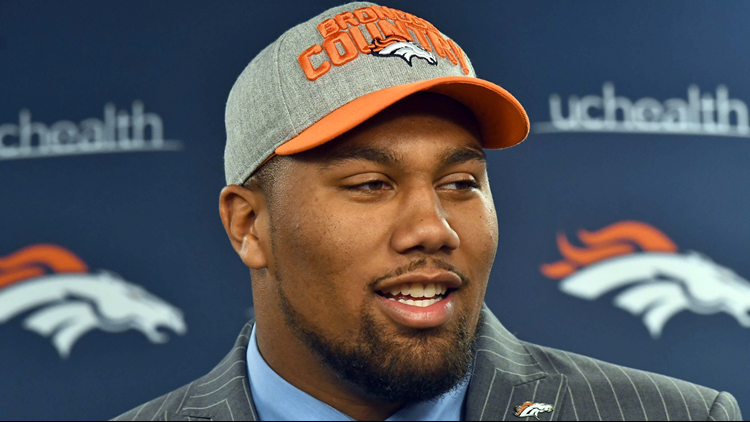 KUSA – Even though their signing bonuses, annual payouts, full guarantees and total values are already known, the NFL’s top 5 draft picks -- including the Broncos’ Bradley Chubb -- have yet to sign their contracts. Why? According to agents with past or present experience representing top 5 draft picks, there are two reasons. One, the timing of the signing bonus installment payouts. Two, offset language. Those are really the only minor negotiating points between the player and team with players drafted high in the first-round. Baker Mayfield as the No. 1 overall pick already knows he’s getting a $21.85 million signing bonus from the Cleveland Browns with a four-year, fully-guaranteed, total value of $32.68 million. Chubb as the No. 5 overall selection knows he’s getting a $17.91 million signing bonus from the Broncos with a total, fully-guaranteed value of $27.27 million. As a rule, teams spread out the signing bonus in three installments over the first 12 months. The player gets at least 50 percent within 30 days of signing and the rest over two other installments. Agents try to get those signing bonus installments paid to their clients earlier than teams want to. But it’s not like the issue leads to a hold out. Offset language can be the source of more contention. The Chargers’ Joey Bosa, the No. 3 overall pick in 2016, held out through the veteran mandatory minicamp, training camp and the first three preseason games in hopes of getting the offset language removed from his rookie deal. He never did get the language dropped, then ripped his hamstring while trying to accelerate his return and missed the first four games of his rookie season. He posted 10.5 sacks in his final 12 games to still win NFL Defensive Rookie of the Year. But the Chargers started 1-3 without him. Offset language? Let’s use Paxton Lynch as an example. He was the Broncos’ first draft selection in 2016, No. 26 overall. Lynch has $600,000 fully guaranteed in the fourth and final year of his contract in 2019. (Not including a fifth-year option, which is to be determined). If he is cut next year, and another team signs him for the minimum $720,000 salary, the Broncos would not have to pay the $600,000 because of the offset language in his contract. If the offset language was deleted, Lynch would get both the $600,000 from the Broncos and $720,000 from his new team. Players like to double dip. Teams like the offset. In the previous two years, the only rookies who got the offset language dropped from their contracts were quarterbacks Jared Goff and Carson Wentz, the No. 1 and No. 2 two picks in the 2016 draft, and running back Leonard Fournette, the No. 4 overall choice last year by Jacksonville. (Mitch Trubisky got the offset dropped in year 1 of his rookie deal with the Bears, but that was mostly for show as no team is going to cut their No. 2 overall draft pick in their first year). That the offset language was dropped from the contract of the No. 4 pick last year could mean the top 5 picks this year will try for a similar feature. (Thanks, Jaguars!) It’s highly unlikely the Broncos would drop the offset language for Chubb. But he can always try. As a practical matter, offset language does not seem worth a squabble. No top 5 draft pick is expected to become such a bust that his team doesn’t want him in year 4. But don’t be surprised if a few of the top 5 draft picks don’t sign until closer to training camp.